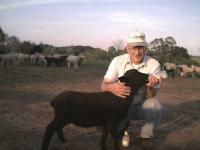 Recently our flock of 52 adults were given their yearly shearing by Ray Chapman, Jr. of Edinburg, Virginia. 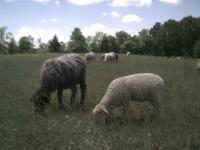 With impending chance of rain, our luck held and all the sheep were sheared. 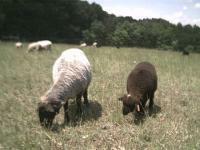 The adults have been enjoying the freedom from the extra fleece, prancing like lambs and moving more comfortably from pasture to pasture. 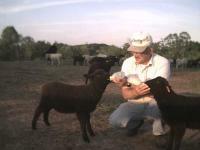 The lambs have been learning to eat from the "creep", which means that they have started to enjoy the pleasures of grain that is placed for them where their mothers can't get in to reach it. 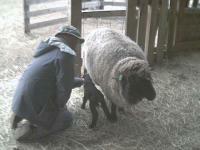 All the lambs are still nursing and two of the smallest triplets, Delight and Diana, are being bottle fed twice a day. 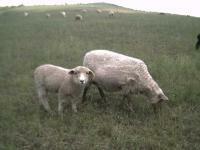 The change of size since birth of this year's lambs is amazing to see. It is hard to believe how fast they grow! Betsy and her single Dreamer.